Leaving Munich very early, we will take the highway towards Salzburg until Bad Reichenhall. From there, it is not very far to the area of Berchtesgaden with its beautiful alpine landscape, nested between the Austrian provinces of Salzburg and Tyrol. Depending upon your personal wishes, we can either start our sightseeing tour with a panoramic cruise on lake Königsee and enjoy the spectacular panorama of the German Alps from the small island of St. Bartholomä or take a ride up to the Eagle's Nest, Hitler's summer residence high above the mountains. 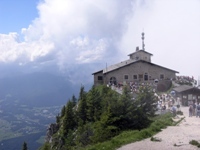 After lunch, you have the choice between a visit to the Obersalzberg exhibition on national socialist Germany including a visit to the Führer bunker or a panoramic tour through the German Alps by car, minibus or coach with many occasions for sightseeing and photo stops. At the end of the day, your driverguide or tourguide will take you back to Munich. Comments regarding our Berchtesgaden sightseeing tours: Full day sightseeing excursions from Munich to Berchtesgaden can be composed of four distinct elements: a ship cruise on lake Königsee, a ride to the Eagle's Nest, a visit to Obersalzburg national socialist museum and a panoramic tour through the German Alps. The team of Munich Tours is ready to organize Berchtesgaden sightseeing tours according to your personal interests and wishes. Of course, our full day excursions to Berchtesgaden can also be booked from different places than Munich, for example starting from Salzburg with Salzburg tourguides or from Tyrol with Tyrolean tourguides.